A long time ago, before the internet really took off, you’d go to record stores, and they’d have listening posts for new albums. One day I was in HMV, and put headphones on to have a quick listen to Bjork’s third album, with no expectation as I wasn’t really a Bjork fan. However I’d read something interesting about this. I was taken by the fact that she’d originally wanted to separate the beats and the strings arrangement in different channels, as I understood it so you could either mix them, or have just one. While she didn’t do this, one of the reasons I love this album is because it brings together such wonderfully different styles. On one hand, the magnificent, crunchy beats from Mark Bell of bleep techno pioneers, LFO. On the other, the sweeping emotional strings of Eumir Deodato who was best known for his work in the seventies. And then on top of this was Bjork’s unique, extraordinary vocals. To me this is an ‘emo’ album, if emo is short for emotional. The strings and the swoop of Bjork’s voice even now have an effect on me. The songs vary from the bubbling beats of the first two tracks, to the violent emotions on Bachelorette, crunchy, concrete beats, and then the ethereal finish of All Is Full of Love. I have never stopped loving the tunes, they have dated well I don’t think there’s a bad tune on the album. And just for the cherry on the top, I adore the cover, which apart from looking amazing, is such a great reflection of its time – Bjork in an Alexander McQueen dress, shot and digitally retouched by Nick Knight (based on a photo from the high end, limited edition fashion magazine Visionaire). The album also served as a launchpad for other people. Videos for the singles were directed by the likes of Chris Cunningham and Michel Gondry, giants of the 90s. 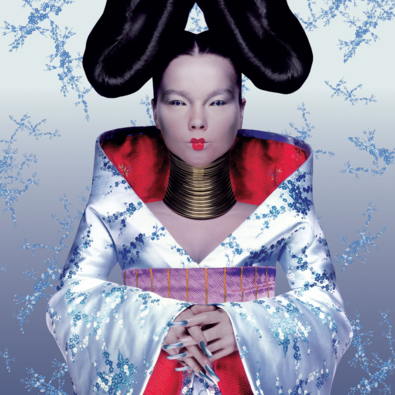 A few years later, hip hop production legend Timbaland sampled a song from Homogenic for a Missy Elliott remix, which seems normal now, but felt very adventurous at the time.